Musical settings of the requiem may be very public (Berlioz's, for example), or almost painfully private. Valentin Silvestrov's Requiem for Larissa falls into the latter category. "Larissa" was the composer's wife, the musicologist Larissa Bondarenko, who died unexpectedly in 1996. Silvestrov responded to her death with this requiem, believing (like Mozart) that it would be the last music he would write. Fortunately for us, Silvestrov was able to go on living, and he completed his most recent symphony in 2003. Silvestrov has received acclaim in the West for his Symphony #5, a work that seems to exist in a place and time after all music has come to an end. While some composers have excelled at writing preludes, Silvestrov has become the master of the postlude. These are not the crystal-clear codas of Romantic symphonies, however. 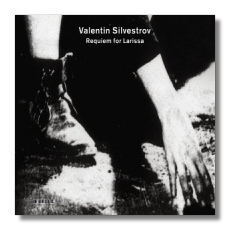 Silvestrov's music is usually in the process of fading into nothing, but never quite getting there. Clarity and purpose are replaced with obscurity and a sense of wandering. Romantic music is alluded to, but never achieved. It is as if Silvestrov is using the expected words, but not stringing them together in the expected sequence. In this music, purpose and direction are tenuous, at best. In Silvestrov's Requiem, composers as disparate as Mozart and Webern flit in and out of the textures… not as musical quotations, though, but as feelings, or as ghosts unable to find their final rest. In Requiem for Larissa, Silvestrov disorients the listener even more by fragmenting the familiar Latin texts. The choir stops in the middle of a phrase as if it has forgotten what it is trying to say, or as if what it is trying to say is too painful to complete. Perhaps it is telling that the most coherent setting is that of the Lacrimosa. In the score's fourth section, the composer interpolates a text from a poem called "The Dream," written by the 19th-century Ukrainian poet Taras Shevchenko. Both of these sections feature solo voices – a soprano in the Lacrimosa and a tenor in the Shevchenko setting. Elsewhere, the chorus bears the brunt of the vocal demands. Most of the Requiem for Larissa is quiet, even pretty, but there are thundering climaxes which appear and disappear with little preparation or warning. At the end, there is no salvation, let alone comfort or resolution. Silvestrov's goal, it seems, is not to resolve matters, but to let us know that closure, if it is possible at all, is painfully elusive. Although Requiem for Larissa was written at a time of crisis in the composer's life, it seems very typical of his work, and it is a good recommendation for those coming to this composer for the first time, and for those who are beguiled by his Symphony #5. The recording sessions took place in Kiev in 2001, and the performance probably is definitive. The singing of the National Choir of Ukraine, called "Dumka," is outstanding. It is unfortunate that the soloists are not identified; it seems likely that they are members of the choir.